Come learn about Phillips County’s most famous fossil bearing formation from the top paleontologists actively working in and conducting research on this formation. Come learn the latest scientific discoveries about the Judith River Formation from the experts themselves! Mary received her Ph.D. from Montana State University (Go ‘Cats!) with Dr. Jack Horner, and is leading the sub-field of molecular paleontology. 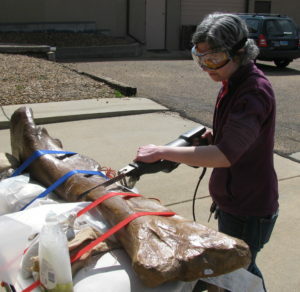 Mary’s research was the first to determine the gender of a dinosaur by recognizing medullary tissue (a tissue found in female birds) in a female Tyrannosaurus from Montana, and her work was the first to show that original organic compounds like collagen can survive the fossilization process and persist for millions of years. Mary’s work is revolutionizing the way the think of and study the processes of fossilization. Jack received an honorary Ph.D. from the University of Montana, and holds several honorary degrees. In 1986 he was awarded a MacArthur Fellowship, and in 2013 Jack received the Romer-Simpson Medal by the Society of Vertebrate Paleontology. Jack’s vast research has been at the forefront of paleontological discoveries and revolutionizing the way the think of, view, and study dinosaurs. In 1979, Jack and Bob Makela described Maiasaura – consisting of eggs, young in nests, and adults all together, this was the critical discovery for understanding parental care in dinosaurs. Jack’s research strives to better understand dinosaurs through several avenues of ontogenetic, histologic, and stratigraphic research. 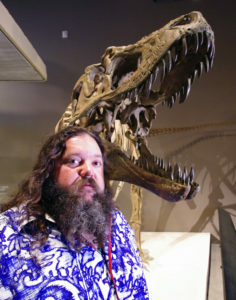 Jack also serves as the scientific consultant for the Jurassic Park franchise, and his favorite dinosaurs are sauropods. 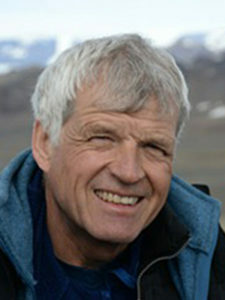 Phil received his Ph.D. from McGill University, and has received numerous professional accolades including: elected to the Royal Society of Canada (1999), awarded the Alberta Order of Excellence (2010), gold medal winner by the Canadian Geographical Society (2012), and the Romer-Simpson Medal by the Society of Vertebrate Paleontology (2017). Phil is a leading expert in theropod dinosaurs, and has scoured the Canadian, Mongolian, and Argentinian (just to name a few!) badlands on the hunt for these carnivorous dinosaurs. Phil was a pivotal member of what would become the Royal Tyrrell Museum of Paleontology. In 2015, Phil’s vast achievements to Canadian paleontology resulted in a museum being named in his honor – the Phillip J. Currie Dinosaur Museum. Eva is Assistant Professor and Curator of Paleobotany and Palynology at The University of Alberta. Eva’s interest in paleobotany (the study of fossil plants) and palynology (the study of fossilized spores and pollen) goes way back into the Cretaceous Period (135 to 64 million years ago). 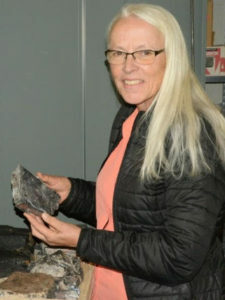 Many of her research projects have taken place in Argentina, Australia, China, Europe, Indonesia, Japan, Madagascar, Mongolia, New Zealand, South Korea, South Africa, and the U.S.
David received his Ph.D. from the University of Toronto, and he is the Temerty Chair in Vertebrate Palaeontology and oversees dinosaur research at the Royal Ontario Museum. 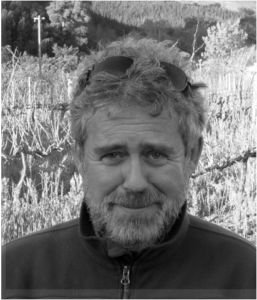 David is is also an Associate Professor in the Department of Ecology and Evolutionary Biology at the University of Toronto. David’s research focuses on the evolution, ecology and diversity of dinosaurs, and their relationship to environmental changes leading up to the end Cretaceous mass extinction event. 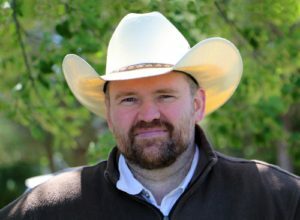 Active in the field, he has participated in expeditions all over the world, including the Africa, Mongolia, and Canada, and has helped discover 10 new dinosaur species in the last five years- including the remarkable horned dinosaur Wendiceratops from southern Alberta, and the wickedly armoured Zuul named after the Ghostbusters movie monster. 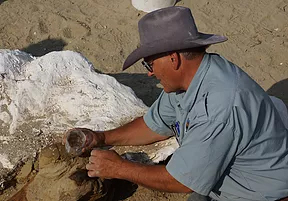 Don studies how ancient animals, and turtles in particular, lived in their environments during the time of the dinosaurs. By comparing turtle specimens from Asia and North America, he investigates why some species lived where they did, what unique traits helped them to survive, and how environmental conditions affected them. This research allows Don to determine the conditions of life during specific periods of history, and why some species survived catastrophic events, while others did not. Ray received his Ph.D. from the University of Chicago, and is a preeminent expert on sedimentary geology and vertebrate taphonomy (Ray literally wrote the book on this subject, entitle “Bonebeds: Genesis, Analysis, and Paleobiological Significance”). Ray’s work on rocks and dinosaurs (and dinosaur precursors) has taken him from the Cretaceous foreland basin of Montana, the Triassic Ischigualasto Basin of Argentina, the Triassic-Jurassic Karoo-equivalent rocks of southern Zimbabwe, and the Mahajanga Basin of Madagascar. 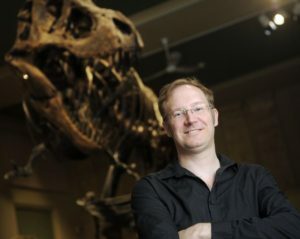 Thomas received his Ph.D. from the University of Toronto, and is a preeminent expert on tyrannosaurs. Studying their growth and development, Thomas strives to shed light on the intimate life history of the “Tyrant Kings”. Thomas’ research on tyrannosaur growth is persistently at the forefront of active scientific debate. Understanding how the bones changed shaped through growth in the famed Tyrannosaurus, Thomas has shown that the previously recognized ‘Nannotyrannus‘ is in fact just an immature Tyrannosaurus (though this is still hotly debated). In addition to tyrannosaurs, Thomas also researches archosaur craniofacial anatomy, the integration of ontogenic and phylogenetic data in paleontology, and sauropod ontogeny (I kid you not!). Liz received her Ph.D. from Montana State University (Go ‘Cats!) with Dr. Jack Horner, and her research focuses on the evolution and ontogenetic growth of hadrosaur (duck-billed) dinosaurs in the Late Cretaceous of North America. 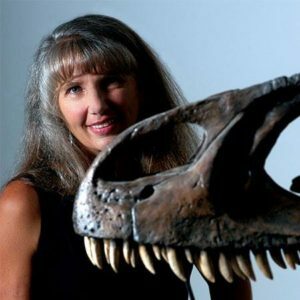 Liz was a previous Director of Paleontology at the Great Plains Dinosaur Museum as well as the Executive Director of the St. George Dinosaur Discovery Site in southern Utah. 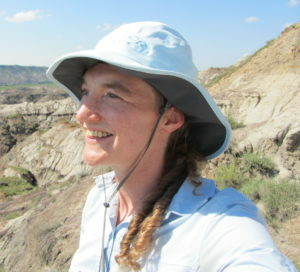 Currently she is an Assistant Professor of Biology at Dickinson State University and an Associate Researcher at the Badlands Dinosaur Museum in Dickinson, North Dakota. Liz will be presenting on one of the new species of dinosaurs named in her dissertation with Jack Horner: Probrachylophosaurus bergei, an ancestor of the Brachylophosaurus specimens that fill the Great Plains Dinosaur Museum. Denver received her Ph.D. from Montana State University (Go ‘Cats!) with Dr. Jack Horner, and his research largely focuses on how dinosaurs lived. Ranging from how “raptor” dinosaurs used their sickle-like claws to pin down prey, the biggest dinosaur in North America, sauropod ontogeny and how they used their feet for nest building, Triceratops ontogeny and how it evolved throughout the Hell Creek Formation, to even how a Tyrannosaurus ate a Triceratops, Denver’s areas of research and expertise span a variety of fascinating topics. Denver is the Curator at the Badlands Dinosaur Museum at the Dickinson Museum Center in Dickinson, ND – in addition to many new displays, the Badlands Dinosaur Museum is doing tons of amazing Montana fieldwork, so go check out their great discoveries! 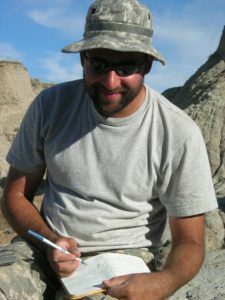 Mark received his Ph.D. from the University of Utah, and he specializes in Jurassic and Cretaceous dinosaurs with an emphasis on the taxonomy, evolution and biogeography of meat eating, armored, and horned dinosaurs. Mark has named over eight dinosaurs including Lythronax, Kosmoceratops, Utahceratops and Seitaad. Currently, Mark is an Associate Professor Lecturer in Geology and Geophysics at the University of Utah, a Resident Research Associate at the Natural History Museum of Utah. 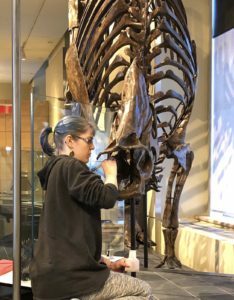 Emily received her Ph.D. at McGill University, and is a vertebrate paleontologist with the Royal Saskatchewan Museum (RSM), working out of the RSM’s T. rex Discovery Centre in Eastend, Saskatchewan, Canada. Emily’s research primarily focuses on Cretaceous palaeoecology, involving the study of plant and animals fossils, geology and sedimentology in order to understand ancient ecosystems. In 2008, she began her PhD at McGill University under the supervision of Dr. Hans Larsson, exploring pre-extinction biodiversity trends immediately prior to the K-Pg extinction in Saskatchewan. Emily has published several papers and numerous conference abstracts of Ediacaran and Cretaceous paleontology. She was a recipient of an NSERC CGS-D Scholarship, as well as a two-time winner of the Geological Association of Canada – Paleontology Division’s Thomas E. Bolton Best Student Paper award. She enjoys public outreach, teaching and fieldwork, often with the help of her dog, Aster. 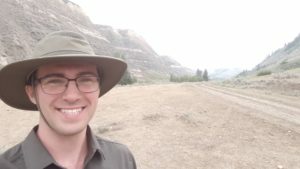 Caleb received his Ph.D. from the University of Toronto with Dr. David Evans, and his research centers around dinosaur palaeobiology, particularly in the Late Cretaceous (83 to 64 million years ago) of Western North America. One aspect of Caleb’s research investigates taphonomy (the study of what happens to an animal after it dies), specifically the role of depositional environments in shaping our understanding of ancient ecosystems. He is also very interested in documenting morphological variation in the horns and ornamentation structures of horned dinosaurs to test ideas regarding evolutionary mode in this group. 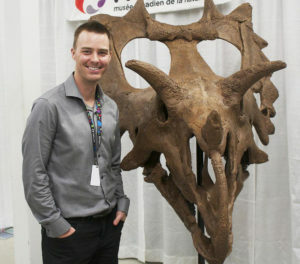 Jordan received his Ph.D. from the University of Calgary, and is a Research Scientist and Head of Palaeobiology at the Canadian Museum of Nature in Ottawa, Canada. His studies focus on dinosaur systematics and palaeoecology, although he is known to occasionally work on other Mesozoic reptiles as well. 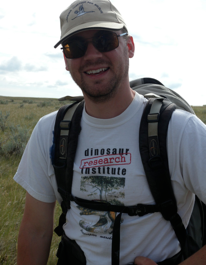 Jordan studies dinosaur feeding adaptations, community ecology and geographic distribution. By carefully examining feeding posture, skull and beak shape, jaw function and tooth wear, he has shown that diverse plant-eating dinosaurs living in Alberta 75 million years ago were able to coexist as a result of their varied dietary specializations. Jordan is also interested in horned dinosaurs, which were among the most successful animals of their time. He investigates their lifestyles, growth, and evolution to determine what allowed them to thrive during the Late Cretaceous Period. Jordan recently published on a showy new horned-dinosaur species from Montana named Spiclypeus. Mat received his Ph.D. from the University of Toronto with Dr. David Evans, and is the Chief Fossil Preparator and Lab Manager at the New Mexico Museum of Natural History and Science in Albuquerque, New Mexico. 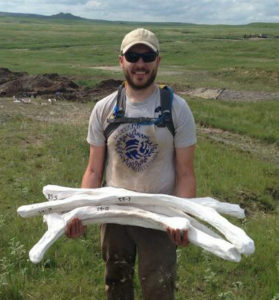 The focus of Mat’s research involves using bone histology and modeling techniques to study the ontogenetic variability of bone deposition and growth of fossil and modern vertebrates, with a particular interest in duck-billed dinosaurs. 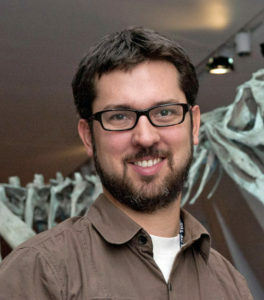 From this, he aims to establish relationships between anatomical, physiological, and ecological changes through ontogeny with biomechanical, nutritional, environmental, and phylogenetic effects and extend these relationships to the fossil record to better understand the evolution of major events in the history of life. Taia is currently an M.Sc. student with Dr. Jordan Mallon jointly at Carleton University and the Canadian Museum of Nature. For her thesis, Taia is researching ontogenetic niche shifts in large herbivorous dinosaurs. Addityionally, Taia has worked on the stratigraphy, biostratigraphy and X-ray fluorescence analysis of mudstone and heterolithic facies in the Dinosaur Park Formation, from Dinosaur Provincial Park in Alberta, the paleoecology from trilobite heads in the Lower Cambrian of Fort Steele, British Columbia, and the stratigraphy and ichnology of coastal plain heterolithic and mudstone facies of the Cambrian Dinosaur Park to Bearpaw transgression of Southern Alberta. Working with sauropod dinosaurs from the Black Hills region of Wyoming, Anthony started his career in 1997 in “The Pit” at the University of Kansas. 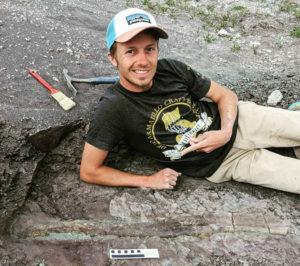 Since then he’s conducted field work in Mexico, Portugal, The Netherlands, and South Korea as well as all over the western United States while working for the Rocky Mountain Dinosaur Resource Center/Triebold Paleontology Inc. in Woodland Park, Colorado. Focusing intensely on the Niobrara Chalk of Kansas, Hell Creek Formation of South Dakota and Judith River Formation of Montana, he’s assisted with researchers worldwide in recovering new specimens of animals. This field season will be his 14th summer in the Judith River Formation. Anthony has participated in naming 4 species of fish (Bonnerichthys gladius and all 3 species of Rhinconichthys), engaged in lively presentations on fossil ethics and legality at SVP and EAVP, and has led SVP workshops on field safety. In his free time he volunteers on the board of directors of several outdoor organizations and city commissions for Open Space management, is a certified outdoor crew leader, and most importantly spoils his golden retriever Annabelle (named after a Camarasaurus, KUVP 129716). Dave Trexler received his M.Sc. degree from the University of Calgary where he studied the famed Montana hadrosaur Maiasaura. He and his family have been heavily involved in dinosaur nesting behavior research (Dave’s mother found the very first baby dinosaurs in a nest – a discovery that would become the famed Egg Mountain locality). 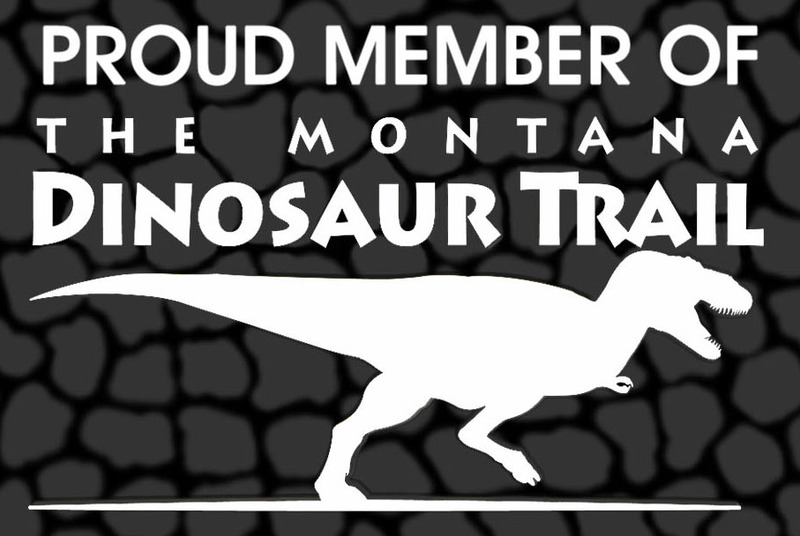 Since 1995, Dave has worked with the Two Medicine Dinosaur Center in Bynum, Montana. Dave’s love of dinosaurs is matched only by his love of flying, and he has spent many hours mapping possible dinosaur-bearing outcrops from the air! Savhannah is a paleontologist at the University of Utah, where she does research under Dr. Mark Loewen, focusing on ceratopsian dinosaurs from the Late Cretaceous period of Southern Utah. 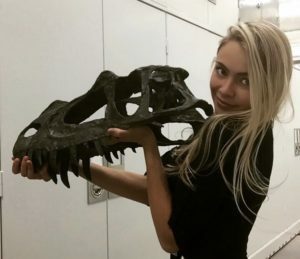 She is currently a paleontology collections intern at the Natural History Museum of Utah and an undergraduate assistant for Dr. Loewen’s introductory paleontology course, World of Dinosaurs. Savhannah has both field and academic experience in paleontology, and is currently completing a Bachelor’s Degree of Geology at the University of Utah. Christian is currently earning a Ph.D. in Biomedical Sciences at Oklahoma State University-Center for Health Sciences under the advisement of Dr. Holly Woodward Ballard. He received a Bachelor of Arts from Michigan State University in 2008 and a Bachelor of Sciences in Ecology from Montana State University (Go ‘Cats!) in 2014. 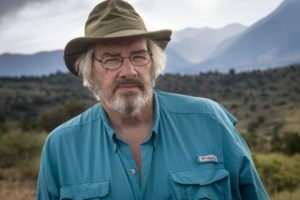 While at Montana State University he worked extensively in the MOR paleontology lab and histology lab under the advisement of Dr. Jack Horner. He is currently investigating bone growth response to various stress and biomechanical shifts in modern taxa and non-avian dinosaurs. Following in the footsteps of Dr. Horner and Dr. Ballard, he is focusing his investigations on intraskeletal bone growth in the hadrosaurid dinosar Maiasaura. Tom is pursuing his M.Sc. at Carleton University with Dr. Jordan Mallon, and his thesis is focused on the extinct reptile Champsosaurus. Specifically, Tom is studying the anatomy of their skulls for clues about their behaviour and ecology. Tom loves all things palao, but he is especially interested in discerning what an extinct animal’s anatomy indicates about how they behaved and interacted with the environment when they were alive. Do you work on the Judith River Formation or coeval formations? Do you want to learn about other research happening in this formation? Do you want to share your research with other scientists and the public? If so, then we encourage you to attend our the Judith River Formation Symposium! If you’re interested in attending, email us at: dinosaur@itstriangle.com. 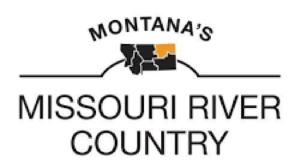 All speakers will be provided lodging while in Malta, MT for the Symposium and an honorarium. The Wine & Dino is free to attend (food and drinks will be available for purchase. The Symposium lectures are $5 a person per day (kids 10 and under free), and tickets will be available on site and at the Great Plains Dinosaur Museum throughout the weekend.